A little more on our recent trip to Portland OR. 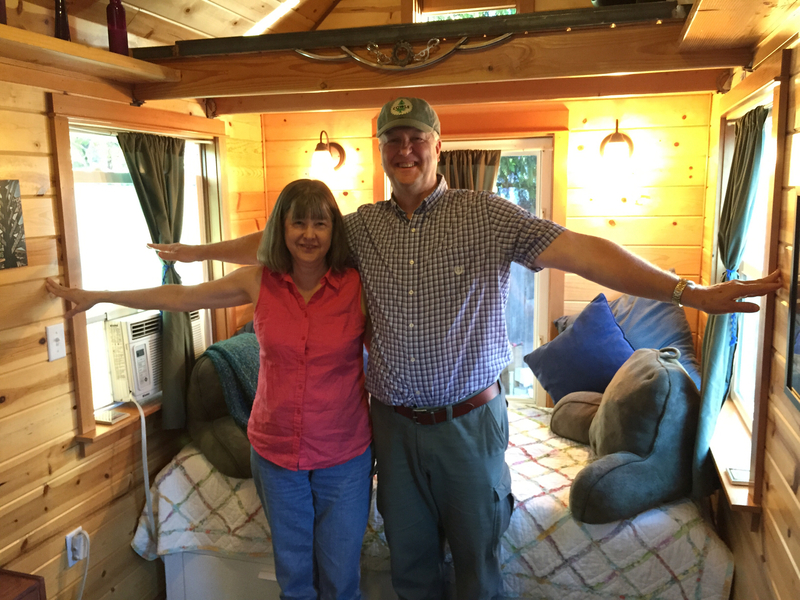 We went on a tour of 7 tiny houses. The houses always fascinate me. They are so cute and the idea of winnowing down one’s items so that there is little to clean has an appeal. Actually living that lifestyle might be another thing! Here we are standing in one of the largest ones which had a footprint of 160 square feet and a loft for sleeping with 60 square feet. The width of it is 8’ so we took this picture for perspective. I of course am under no illusions I know I would need one for living and another one for a fiber studio. I won’t winnow down that far! Of course we ate and ate and ate. I love their clusters of food trucks. 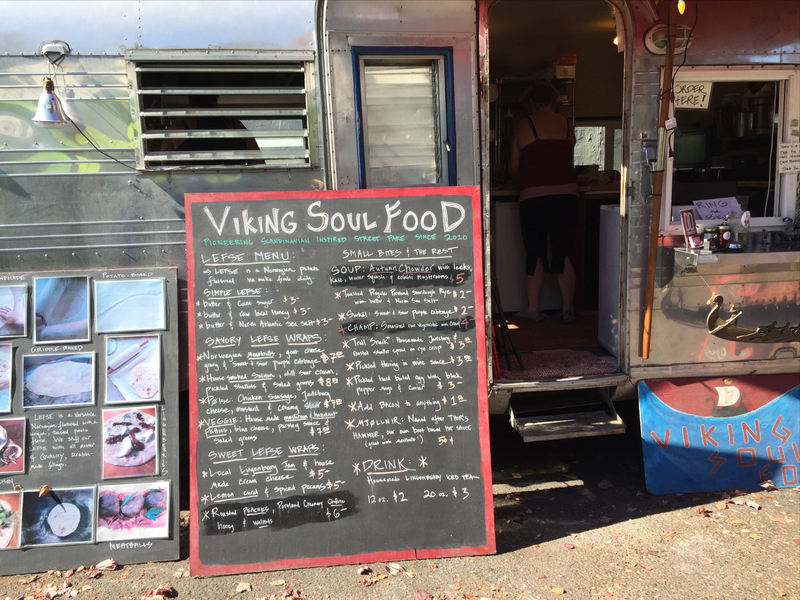 Never before have I knowingly eaten Viking Soul food. There was a troll snack but what I learned of trolls in Norway made me reluctant to try that. We had to visit Rimsky’s. It is open only for dessert at night. It is in an old house that has a creepily fascinating décor. It kind of has to be seen to be believed. On our last visit our table very very slowly rotated. Another one reportedly slowly goes up and down on its own. I also shopped at my son’s girl friend’s shop, Johan. Lots of beautiful ceramics and many other items most made locally. I can’t show many pictures since I was Christmas shopping. But for me I bought this bag made out of old billboard signs in Portland. 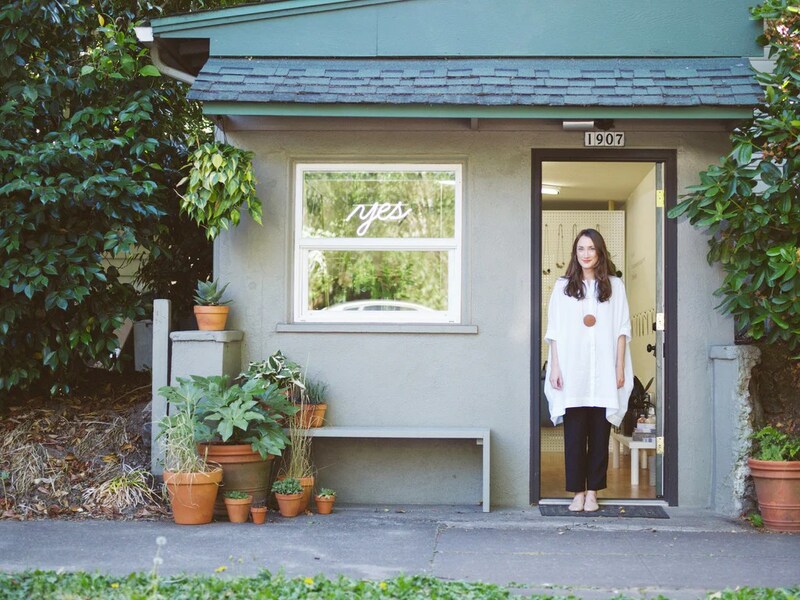 So unique as is everything else in her shop. 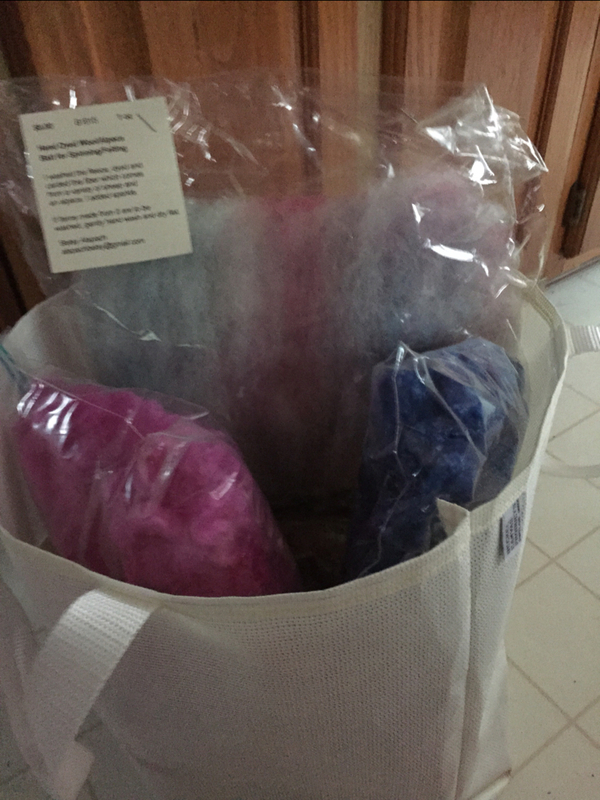 The bag is extra good when filled with my fiber. The only thing we did not do that was on my list was to visit a cat café called Purringtons. Next time. 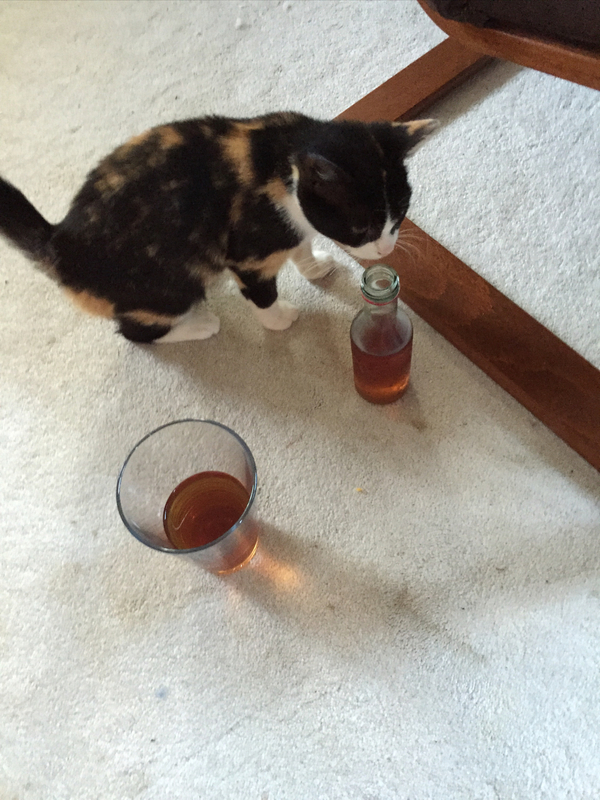 We returned home to…a kitten. It will probably come as no surprise to any cat lover that as a friend says “Oops- I adopted a cat when I wasn’t looking!” Well, we went to a shelter to talk about fostering a mother cat and kittens because I wasn’t ready to start a permanent relationship with a cat but wanted cats around. 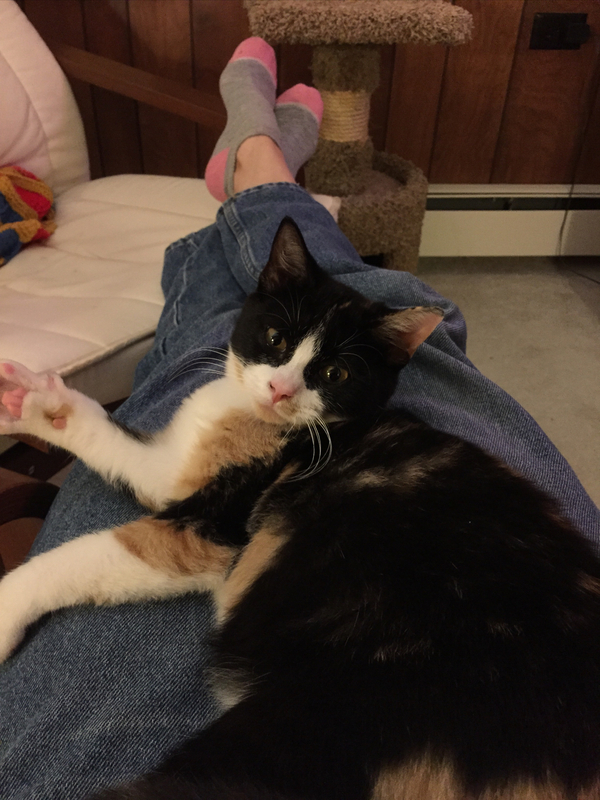 Yes, I admit I did look at their web site the night before and saw a calico kitten who had been homeless and needed a quiet home at which to gain trust in people. Kind of the same story and type of cat we encountered when we adopted our dear departed cat. So, I asked to see her. The people at those shelters are very good at their jobs and they quickly plopped her in my lap and she snuggled down and suddenly I was ready for a permanent cat! Well, within a few days she came out of her shell with us and now voluntarily jumps into my lap to attack my hands. Steve called her a pipsqueak and thus came the name Pippi. 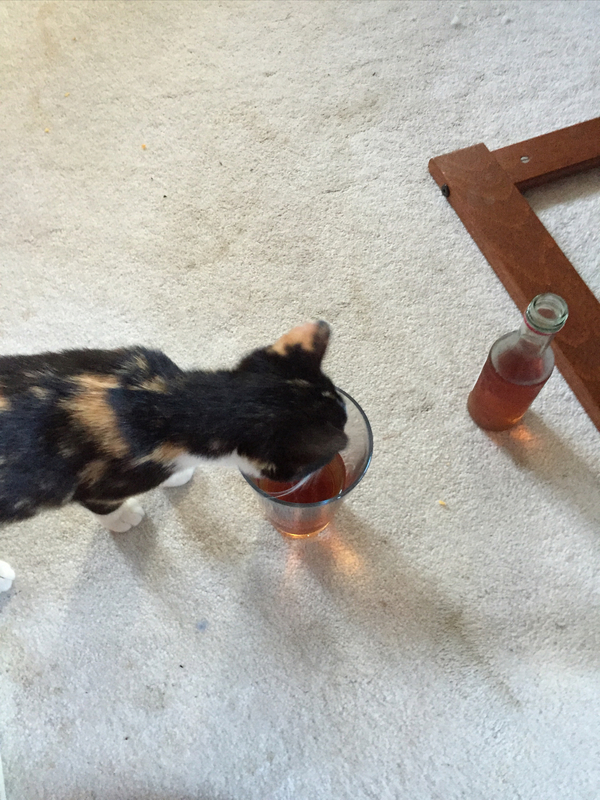 Pippi and I share common interests. Beverages for one. 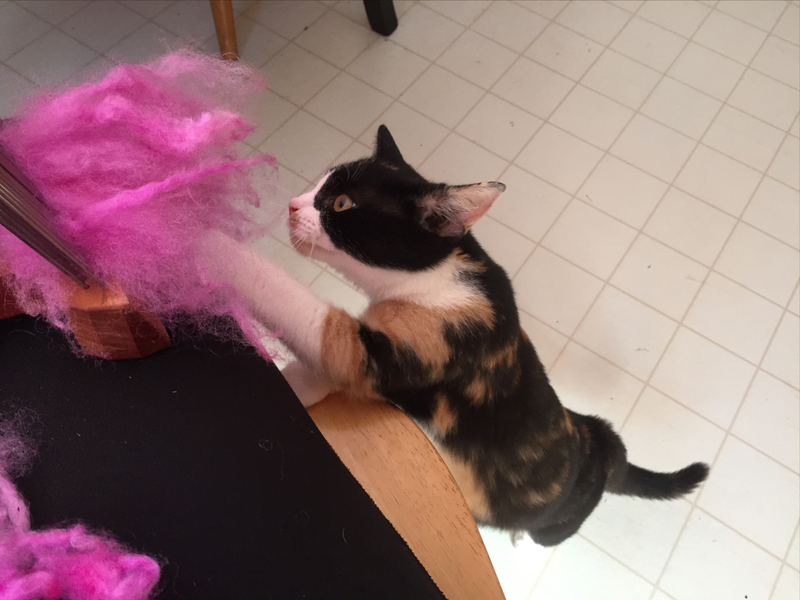 Also intensely combing fiber until it is just right for spinning. In the end I am not sure if she sees my value as a companion, or as a place to nap and as a chew toy. Either way I will take it! 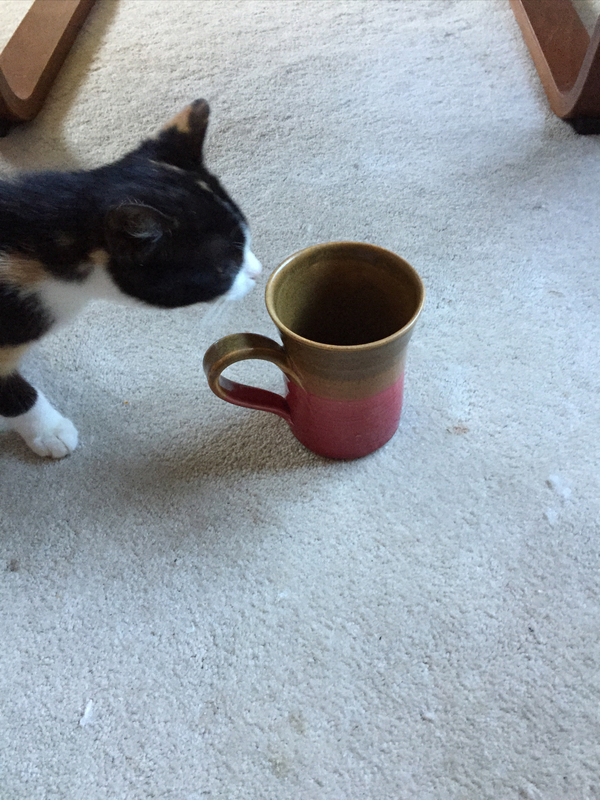 This entry was posted in Uncategorized and tagged cats, combing fiber, food truck, Johan Portland OR, kittens, Portland OR, Rimsky's, Tiny houses, Viking Soul Food on October 14, 2015 by Betsy Alspach.